Face packs are very important part of skincare regime. Especially in country like India where roads are so dusty we all need to take care of our skin a lot. I trust herbal products for my skincare regime. Whenever I chose a face pack I make sure that it should be enriched with herbal ingredients. Among manufacturers of Herbal Products one of the best brands available are Himalaya. 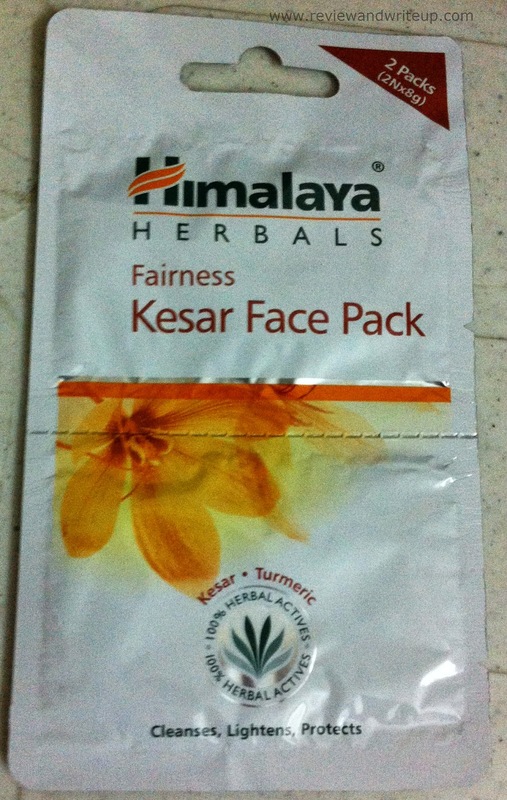 Today I am going to review Himalaya Herbals Fairness Kesar Face Pack. About the Product – This product as name suggests is launched by Himalaya Herbals. The brand specializes in all kinds of herbal products be it a face wash, face packs, scrubs, creams, lotions etc. This one is Kesar so key ingredient should be Kesar along with other ingredients. Packaging – Face pack comes in two type of packaging. One in form of tube and other in form of Sachet. I always buy sachet for my use. Sachet packaging is also very neat and sturdy. Its white color packaging with all kinds of product related information printed on both sides. Pack comes in a twin pack and it’s easy to tear them into two different sachets. One sachet is enough to use for one time by one person. Claims of the Product – Product says it’s a natural skin lightening pack enriched with antioxidants which lightens dark spots and enhances complexion. It removes impurities and exfoliates the skin. Cinnabloc, a herbal sunblock provides effective protection for your skin from sun’s harmful UV rays. R&W Review – I have been using Kesar Face Pack for quite long. I always scrub my face first then remove the scrub. Then I apply face pack on my face, neck avoiding eye areanand leave it for like 15 minutes. In the meantime I keep myself with other chores as it’s so difficult for me to sit idle with face pack on. I then wash it away. Result I could feel that my skin has been cleansed deeply and skin has become soft, supple, hydrated, clean, and clear. I use face packs like once a week or sometimes twice as well. With its regular use you will feel slight difference in your complexion. It also have cinnabloc which is natural sunbloc. I don’t mind using fairness creams, lotions, face packs as long as it doesn’t have bleach in it. Healthy glow is always my way. The effect of this face pack lasts up to 3-4 days easily. Sometimes if I have to go for a party I use previous day so that my skin could benefit from overnight glow enhancement. I use it in sachet form and it’s so convenient to store. The packaging is so good that you don’t have to worry if product will be spoiled. The product is Hypoallergic without any chemicals in it. When you will apply the face pack you might feel tingling sensation and little irritation it’s because of presence of natural ingredients in it. Its smell is so enchanting that you won’t mind keeping on your face for long. The face pack is suitable for all skin types. Sachets are traveling friendly as well. When I went abroad I carried few with me without any fear of spoilage and spillage. Product also states that natural herbal formulations tend to change color over time but product efficacy remains unchanged. R&W Recommendation – For daily skin care regime this is one of the best affordable, herbal products available in the market. You don’t have to worry about skin type as well. Worth trying these. Alchohol in a face mask sounds odd..I like their neem mask though..never tried this one..will give it a go!